For various reasons, when you are doing research on having a roof installed on your property, it is sometimes necessary for you to accurately determine the pitch of your building’s roof. This may seem like a daunting task, but it is relatively simple. Roof pitches are referred to as a number in ratio to 12. They are usually written out as 3:12, 4:12, 5:12, etc. and spoken as “three-twelve,” “four-twelve,” “five-twelve,” etc. If you were to look at one-half of the truss that creates the roof pitch as though it’s a triangle, the 12 would refer to the bottom of the triangle and could be feet or inches. The other number, then would be the vertical leg, or rise, of the triangle and would be referred to in the same unit of measure. Therefore, as an example, a 5:12 pitch roof would rise five feet for every 12 feet that it goes back horizontally. A 12:12 roof would rise 12 feet for every 12 feet it goes back horizontally, creating a 45-degree angle. When determining roof pitch on a building, it is easiest to do so from a gable end where using a level, you can take clear measurements. On a hip roof, you must take the measurements from the rooftop. Using a 24” level can work very well. The reason this measurement must be divided by 2 is that it was taken at 24” rather than 12”. As an example, if the drop was measured at 14” when measured from a 24” level, the roof pitch is 7:12. 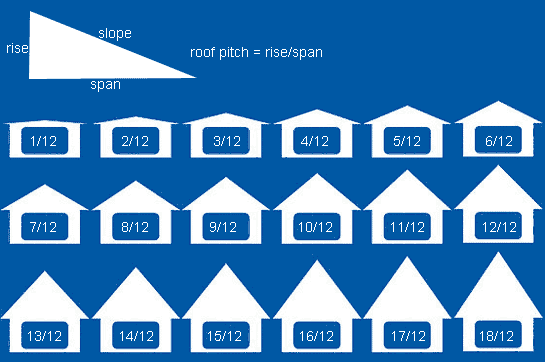 If your roof already has a dimensional product installed such as tile, shake, or formed metal products, LINK your pitch measurements must take this into consideration and, if both ends of the level cannot fall at the same “thickness” of the dimensional product, you must make the appropriate allowances to determine the actual roof pitch. Also, there are a variety of “pitch gauges” that one can view a gable end through to determine pitch. When doing so, though, you need to be square to your building and as far away as possible. For more explanations of roofing-related concepts, read additional articles in this blog, visit asktoddmiller.com, or simply contact Middle South Systems. We are more than happy to help you solve your roofing problems.